The Face on Mars was one of the big Fortean phenomena of the 1990s. The original NASA images were taken in the 1970s, but interest in the subject really took off in 1988, with the publication of Carlotto's digitally enhanced photographs showing an impressively humanoid-looking physiognomy. Interest in the Face continued until 2001, then plummeted when new, higher resolution imagery revealed a much less convincing picture. It's striking therefore to come across the phrase "The Face on Mars" in a comic from 1958 -- specifically, in Issue #2 of Race For the Moon, published by Harvey Comics. 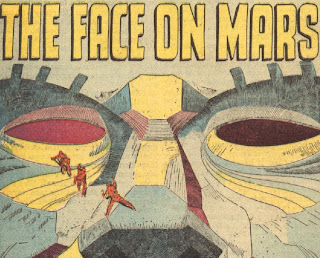 "The Face on Mars" is a 5-page story written and drawn by Jack Kirby (splash panel reproduced above). The Face in this story is carved on a vertical cliff face, not a horizontal feature like the "real" Face. As the astronauts climb up it one of them falls, is knocked out, and while unconscious has a vision of the ancient Martian civilization that built the Face. That's all... it's as if Kirby, having come up with such an inspired title, didn't really know what to do with it. Still, over the years he produced more than his fair share of Fortean comics -- including New Gods and The Demon for DC, and the von Däniken-inspired Eternals for Marvel Comics. Race For the Moon is out of copyright, and you can read it online at Golden Age Comics if you have an account with them.